What are ActBlue Express users and why are they helpful? ActBlue Express Users are donors who have saved their credit card information with ActBlue, and can donate with just a single click. That means they’re more likely to give to you, and other campaigns and organizations they support, again. Because the ActBlue Express donor universe is so large (4.8 million and counting), you’ll find many of your supporters are already a part of it. What is ActBlue Express Lane and how can I get it? ActBlue Express Lane lets donors with ActBlue Express accounts (they've saved their credit card information with ActBlue) contribute instantly from an email. Donors just click the link for a specific amount and their card is charged. The donors don't have to spend time filling out a contribution form. All the work's done for them! If you’d like to try Express Lane, let us know here. I just made a custom contribution form but I can’t find it in my Dashboard, what happened? 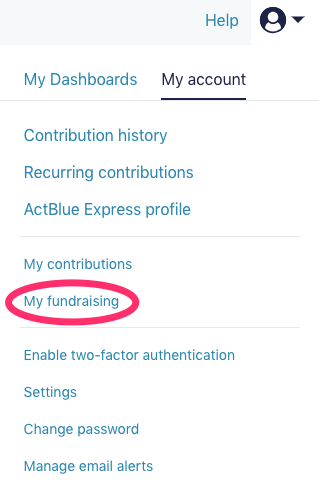 If you made a contribution form to raise money for an entity that you do not manage on ActBlue, go to the navigation bar at the top of your screen and click on the User menu icon. Open the My account tab and select "My fundraising." If you made a contribution form for an entity that you manage on ActBlue, you can always search for the form name in the Contribution Forms tab of your Dashboard. What does it mean if I'm a "form owner"? Where do I find my forms? Forms can only have one owner (unlike accounts which can have multiple users) and form ownership is automatically given to the person who creates it. Form owners can delete the form. Everyone who is a user on the committee’s account can edit the form and see the fundraising total. You can find all of the forms for an entity (those made by you and by others) in the Contribution Forms tab of the entity's Dashboard.